When we think of brand we first think of logo (even though we know a brand is much more than its logo). The logo is the key point of visual interaction with a brand, hence we are likely to recall it every time we think (or talk) of – or write about – a brand. 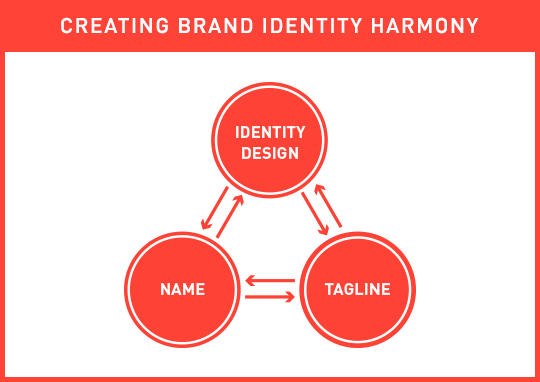 The 3 core brand identity components need to complement each other, each adding something unique to the whole story, and together forming a cohesive and strong initial brand message. If your name describes your business, do not focus on showing the same message in your logo; instead use your logo to talk about other key elements that describe and differentiate your business. If you are in the cloud storage business and your name includes the two words cloud and storage (A bad company name, yet good example: Cloud Storage Ninjas), have your logo visualize security and stability, if those are key components of your brand’s message. Contrary, if your name is nondescript, either fabricated or an acronym, ensure that the associated brand identity design visualizes what you are in business for (EG: “Cloud Storage“). Often forgotten during the brand identity design process (and beyond) is…the tagline. There are many factors to blame for the slowly occurring extinction of the tagline (mainly of digital nature, as tag lines are hard to squeeze into apps and templated web sites), but the power of a great tagline is still immense (Just do it, I say!). The tagline should be alive and kicking even though its placement has changed (from the traditional place below the brand identity design). It can now be used as the first header users see on a brand’s web site, the descriptor below the company name in an email signature, in place of yet another step-and-repeat icon pattern on a back of a business card, or in the often underestimated – yet early – brand touch point, the lobby of a business. The tag line is a powerful tool, that, together with the name and brand identity design, tells a stronger, deeper and more actionable initial brand story. It is a leading actor and you can write the script. Keep the bigger picture in mind when embarking on your identity design project and use your Brand Platform to ensure these 3 core elements touch on more than just one or two of your core values and differentiators (while keeping it visually simple). Next week I will talk about why our identity design looks the way it does. Are we not following our own rules, are we lazy, or is there a different strategy at play? Hint: It’s the latter.